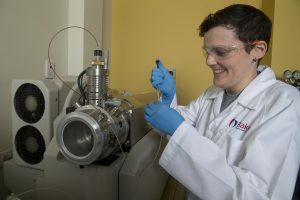 The Baker Institute’s Metabolomics Laboratory uses state-of-the-art tandem mass spectrometry to obtain metabolic profiles (primarily lipids and fats) from cell and animal models, in addition to clinically relevant human samples. The platform has developed a targeted lipidomics approach that enables quantification of more than 600 lipid species across 25 lipid classes and subclasses. The analysis is performed byliquid chromatography tandem mass spectrometry.